Let me just say it... Our entryway is problematic! 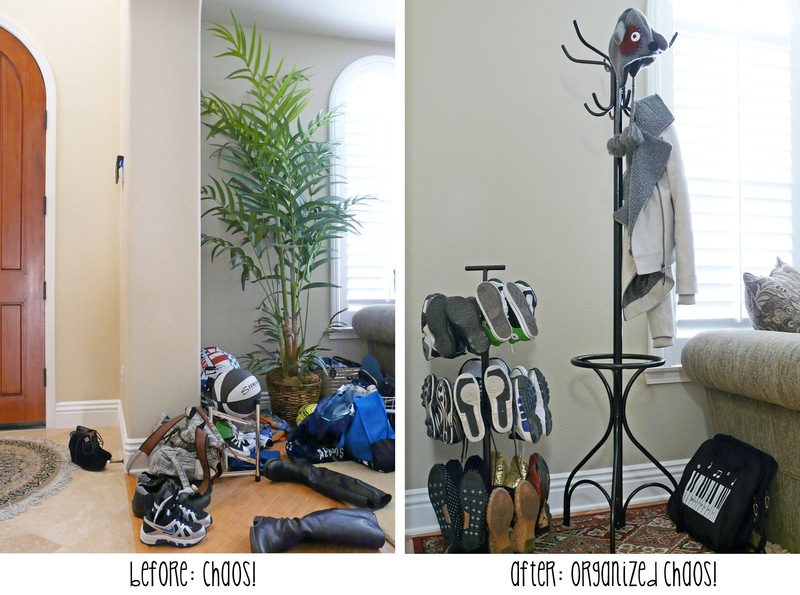 We are a shoes-off household and when we enter through our front door, shoes, backpacks, and jackets are discarded immediately upon entry. Unfortunately, this means that our formal living room also doubles as a mudroom. gasp! Oh the horrors! We do have a large hall closet, but it's in the middle of the house and too far away for the sand-dropping, mud-tracking set. So our living room has to double as a "mudroom". Poor living room... If he had a voice it would be British and he would be cursing and tossing around "bloody" left and right. Kidding... sorta. So balls, boots and bags... oh my! They took over our entryway and they had to go. The balls went to the garage, the boots found a new home and the bags with sports gear went into the closet. And the jackets and hats and shoes... why they found a new and improved "home" on their proper racks. So here is the reorganized entry. Let's start with the coat rack, shall we? After months of searching for just the right coat rack, I finally found it on Ebay. The requirements were: 1) not too traditional, but not too modern; 2) sturdy enough to actually hold something; 3) it mustn't tip over easily or become a jungle gym (remember I have 2 little monkeys). I think we have a winner. 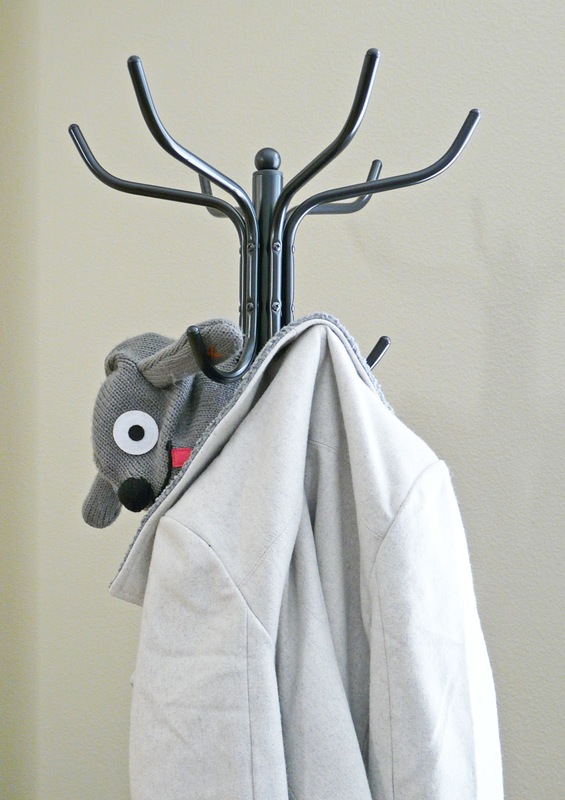 It is similar to this popular coat rack but we paid less. I was a little worried when I saw the little box that it came in, but the mister pieced it together rather quickly and it feels pretty sturdy. We loaded it down with all of our winter coats and it's standing strong. And the "monkeys" have not yet attempted to climb it. Hurrah! 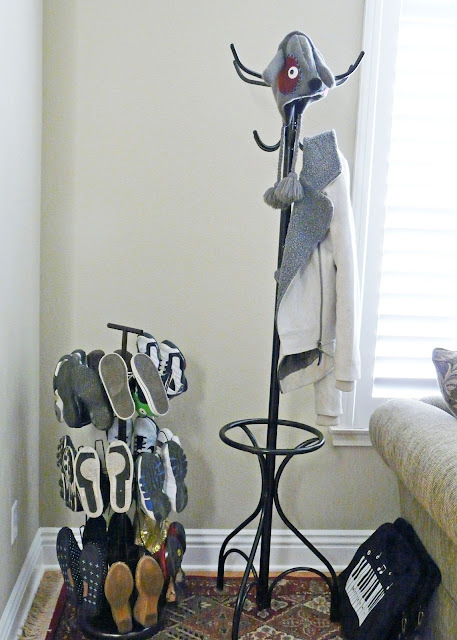 Next up, the shoe rack. This shoe rack is a gem (found it here for a little cheaper and free shipping). 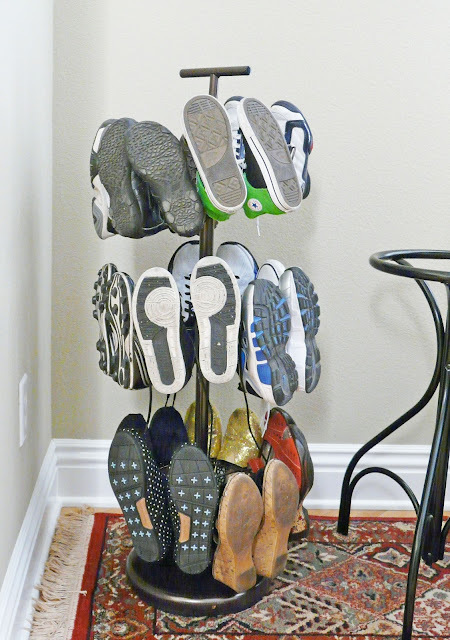 It's sturdy, each rack revolves individually, and it fits 18 pairs of shoes. And the best part-- I assembled it myself! The boys (with their many pairs of sports shoes) and my shoes fit on it perfectly. The Mister's big shoes, however, have their own cabinet. The racks also adjust up and down and I guess we could try to put some of the Mister's shoes on there too, but... Nah! So it's Day 4 of our newly organized entry. So far, so good. The four year old is really good about putting his shoes back on the rack. He also loves spinning the rack around to select his shoes. The six year old may need a little more training... but it's still early. The true test would be to check back in a month and see if this area still looks like the photo above. Crossing fingers. This is hopefully a temporary fix because ideally, I'd really like to start using the garage entrance. I've been saying that for awhile, but a lot of things need to happen before we can do that. Like fix the garage door since it tends not to work when it rains or when it's too sunny, or when the wind blows. True story. So until then, we have our Living Room Mud Room. Hey, at least we can actually say that we use our living room!